Defending UAAP softball champions Adamson University Lady Falcons have officially back in familiar territory. The Lady Falcons did well enough to prevent an upset from the University of the East Lady Falcons, 5-3, to wrap up their elimination round campaign with their eleventh win and the seal the number spot in the Final Four, Monday morning at the Rizal Memorial Baseball Stadium. Despite a slow start in the first inning – which saw only transferee Arianne Vallestero breaking UE graduating pitcher Lovely Redaja’s defense – the San Marcelino-based squad broke bats in the following inning after taking advantage of free passes on first. Jeanette Rusia saw four balls pass her zone before Remie Herero suffered an opposing fate as she was fanned. Clariz Lozada added a woman on base after another single, setting up Angela Gabriel for a double that scored the previous Homerun Queen Rusia. UE did well to cut Lozada off, but a sacrifice fly to the center off Aliza Pichon was enough to send the designated player home and to double the lead at 2-0. With runs a luxury in a defensive tussle, two more runs in the fifth and another in the sixth was enough for the Falcons to go comfortably ahead entering the seventh inning. 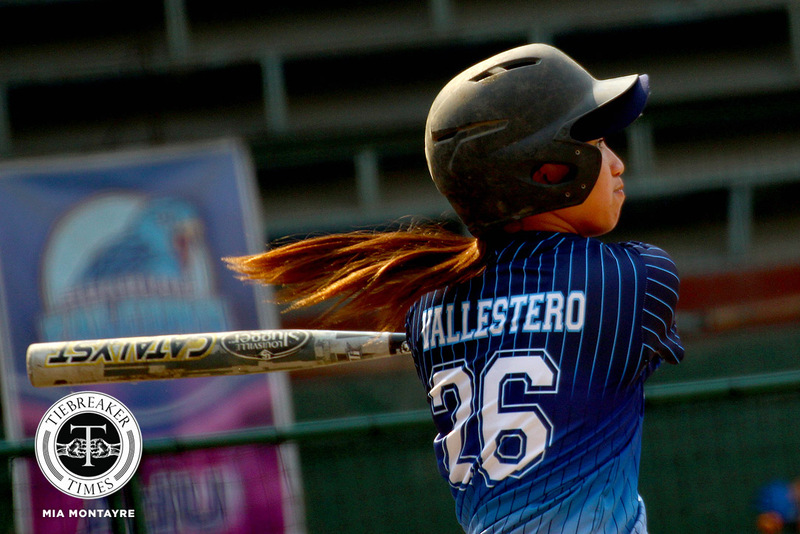 Vallestero padded her home run tally to three – tying University of Santo Tomas’ Charlotte Sales – to perhaps put away the game for good in the fourth, taking MJ Maguad along with her on a one-out situation. Nicole Padasas got another single afterward, but the Falcons could not add another in this inning. Nonetheless, they eventually got another run in the following inning. It was then up to the defense to seal the win. The Lady Warriors went down fighting, however, as their graduating seniors made a last-ditch effort for a comeback in the sixth inning. Super senior Imee Salvador closed out her UAAP career with a homer of her own that scored her and fellow senior Lourdes Blanco. However, the count ended at 5-3, as Arlyn Bautista sent Redaja packing on her last career at-bat. Princess Jurado ended her near-impeccable performance in the circle, limiting UE to five hits and dismissing two batters in the process. On offense, it was the third baseman Vallestero who made her mark with three hits in four at-bats (.750 AVG) – though none bigger than her third homer of the season that pushed Adamson to a decisive advantage. Nonetheless, the long-time mentor hopes that the Lady Falcons will get their bearings soon. “Masaya pa rin dahil nakuha pa rin namin yung number one, so magko-concetrate na lang kami sa semifinals. At buti nga may time to train, like tomorrow. So titignan namin kung paano i-aadjust ulityung mga ginagawa namin, especialy sa hitting namin kasi yun ang kailangan namin,” she added. Besides Redaja, Imee Salvador and Lourdes Blanco played their last game for UE, who ended their campaign with a 3-9 slate. The Lady Falcons will take on either the University of the Philippines or the National University on Saturday, March 23 at 9 am for the Final Four, armed once more with the twice-to-beat advantage.